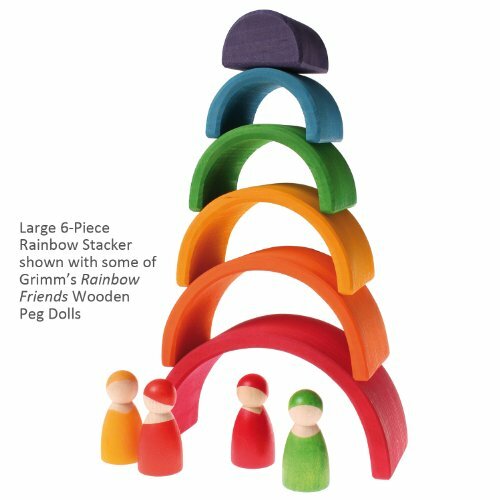 This is 6-Piece Rainbow and is a beautiful and versatile Waldorf-inspired wooden stacking and nesting toy that represents the element of "Air." 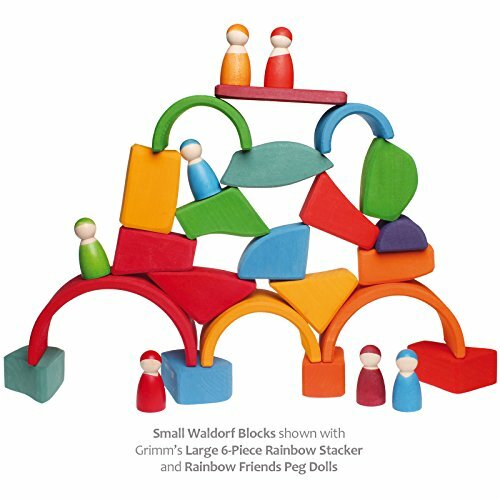 Made from naturally stained, unvarnished wood, the rich vibrant colors and natural feel of these chunky blocks will attract children, and provide hours of imaginative play. The pieces nest together perfectly because they are carved from a single piece of solid linden wood. Children will explore colors, refine their hand-eye coordination, motor skills, and expand their reasoning and creative abilities when playing with these lovely blocks. When not nested or stacked, kids will discover endless uses for the colorful arches: bridges, tunnels, fences, houses of small dolls or action figures...plus any number of unique configurations. The possibilities are boundless when children are left to their own imagination. Of course the blocks can always be easily combined with other toys or blocks in creative play. 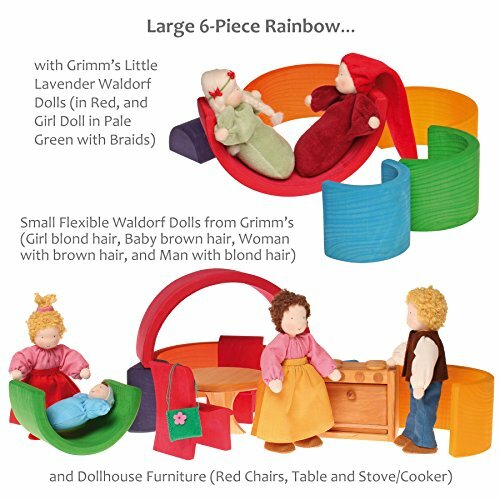 Such an open-ended toy will accompany your child for a long time and be rediscovered along the way. This unique toy has earned the Spiel Gut Award distinction -- an award by the German Design Association's Committee of Games and Toys which recognizes high quality children toys that are also ecologically sensible. Ideal for children from about 18 months and up. Even adults will find Grimm's Elements Blocks irresistible, and enjoy using them as tactile sculptures on the desk, coffee table or bookshelf. Available individually, as a complete set, or in Small sizes. Grimm's Spiel und Holz Design creates handcrafted, imaginative wooden toys for kids of all ages in their factory in the German countryside. Inspired by the philosophy of Waldorf education, Grimm's inspires open-ended play and aims to help children discover and develop their own creativity.